Leather working gloves with stretchable & breathable spandex back keep your hands cool and comfortable on the job. Light Weight and Comfortable for all day wear, great gardening gifts for men & women. General purpose utility, driver, rigger, safety, and gardening gloves. Premium Shoulder split cowhide palm provide extra grip and durability. Premium Shoulder Split Cowhide Leather Palm: One piece palm design leather working gloves provides maximum dexterity & durability & grip. Flexible & Breathable Spandex Back: Stretchable spandex back keep your hands cool and comfortable during the working. 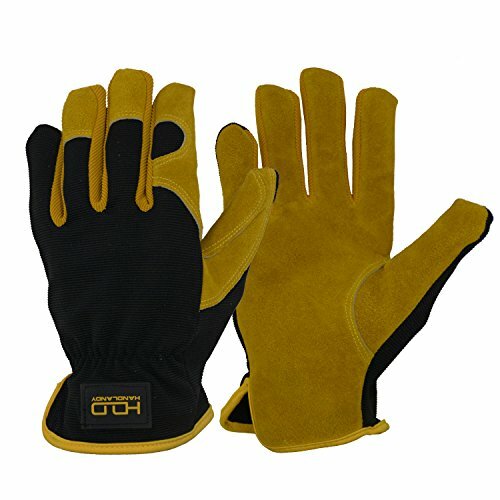 Cotton Lining Palm- Absorb moisture and sweat & added comfort during the working, general use: Material Handling, Rigging, Hand Tools,Driver Gloves. Easy On. Easy Off : Short slip-on cuff for easy on and off. And the stretch elastic wrist closure provides a secure fit to your wrist that allows for easy glove removal between tasks. Leather Hybrid Glove - This soft & durable lighter-duty leather gloves, provides the protection and durability of men & women, gardener, truck driver, with the fit and dexterity of a performance glove. If you have any questions about this product by HANDLANDY, contact us by completing and submitting the form below. If you are looking for a specif part number, please include it with your message.